This is from the U.S. Census Bureau, a blog called Random Samplings. It seeks to answer the questions, “How likely am I to be employed and how much money will I make, if I get a degree. 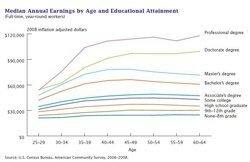 The two graphs are a result of the “Education and Synthetic Work-Life Earnings Estimates” report, which includes some of the hard data that the graphs illustrate. It might be interesting to ask students to add up, over a number of years, the money they might make if they finish their degree — or the car thy might afford, house, cloths, etc. I also wonder if there are other ways to illustrate the data across time. ← How Do We Get More Students Interested in Math, Science & Tech Careers?